This is Sandy Brown Jensen, and you’re listening to Viz City, KLCC’s arts review program. January has three very special, intertwined gallery shows going on that I want to give you a heads up on today. Everyone is collaborating with everybody else in a jamboree of Oregon artists, but I’ll keep it bare bones for you. This JSMA "Visual Magic" exhibition will showcase how this generation of artists continues to represent the highest levels of artistic statement and creative accomplishment, while maintaining commitments to personalized styles. The Jordan Schnitzer Museum of Art has a big show called Visual Magic. It invited 45 artists who began their creative careers in Oregon during the 1960s and 1970s. On the weekend of Saturday, January 19 – Sunday, January 20, 11am to 5pm, you can enjoy a free weekend of admission at the JSMA. This show runs through May 12, so stay tuned for my interviews with involved artists, beginning with Yoncalla artist Susan Applegate on Jan. 23. 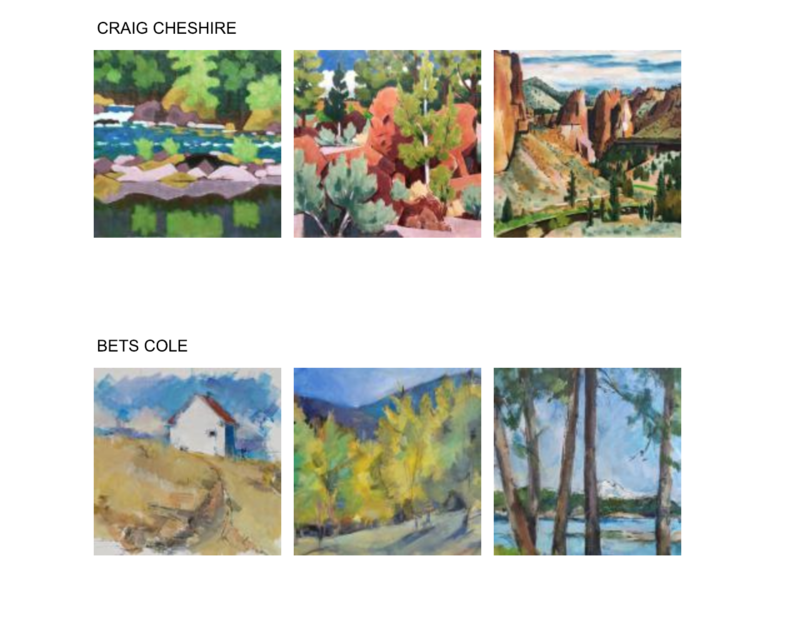 Over at the Karin Clarke Gallery at 760 Willamette, is another Visual Magic exhibition featuring five Oregon painters represented by the gallery. Painter of light Margaret Coe is there, as well as the effervescent Bets Cole and others. That is a one month show from Jan. 16 to Feb. 23. A reception will be held Saturday, January 19 at 4 pm. Craig Cheshire and Bets Cole join Margaret Coe, Humberto Gonzalez, and Erik Sandgren in the Karin Clarke Gallery for "Five Oregon Painters"
The third show in this round up of Oregon visual magicians is by yours truly. 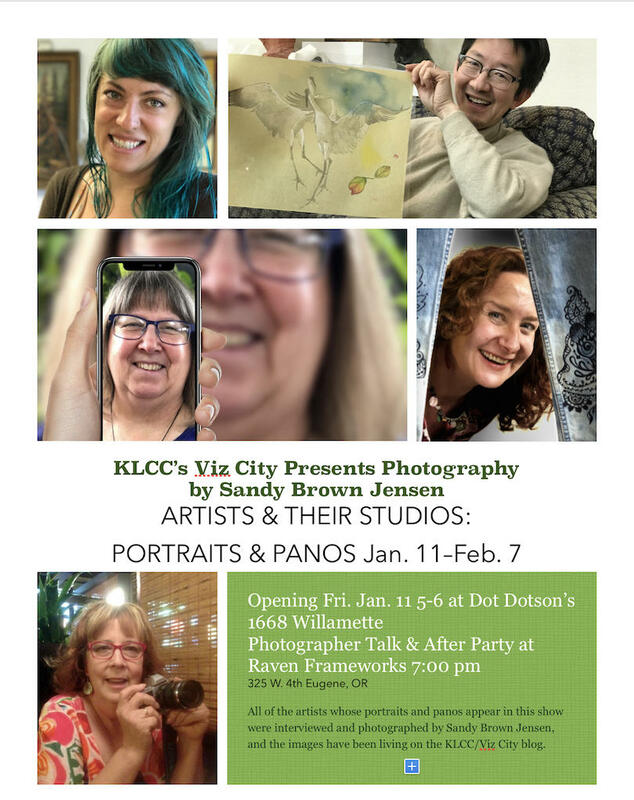 I have taken photos of thirty local artists I have interviewed for Viz City off the KLCC blog and put them onto the gallery walls at Dot Dotson’s gallery, 1668 Willamette. It’s called “Artists and Their Studios: Portraits and Panos.” The Second Friday opening is this January 11, 5-6 pm at Dot Dotson’s. I’ll give a short talk at the After Party at 7 pm at Raven Frameworks at 325 W. 4th. It’s a winter celebration of Oregon artists on all fronts, so put on your bright yellow rain boots and come on out to see some visual magic.